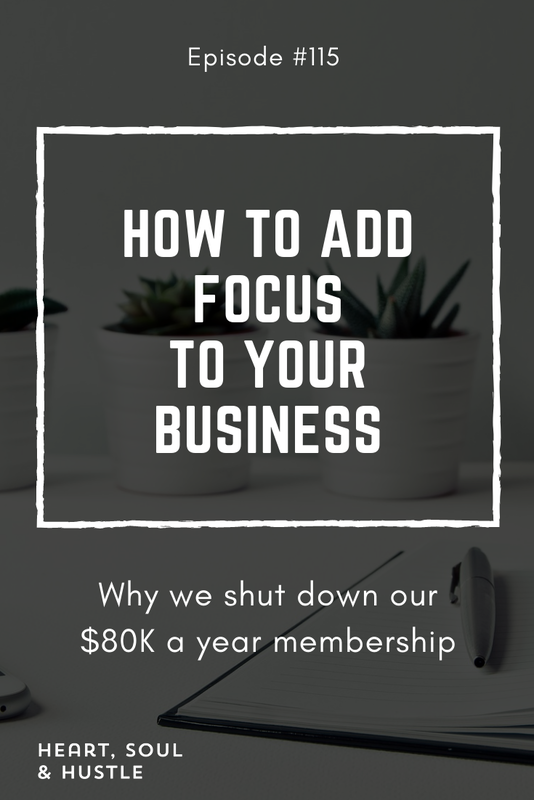 When we shut down our Monthly Marketing Playbook Membership this month, it had generated over $80k in 13 months, with not a lot of expenses being incurred to operate it. However, In 2018 we realized we had a lot of things we were trying to focus on, including a Facebook Ads program, a Facebook Messenger Bots program, 5-Figure Challenge program and mastermind group. Essentially we got spread too thin last year trying to focus on all of these things. We were happy with our overall revenue for the year, but not with each individual project. Going forward, we’ve decided to focus on one project at a time, which for us is our flagship 5-Figure Challenge program. I found that I also ended up on the “content hamster wheel”, and it felt like I was pulling content out of me, instead of having it come from a creative place. So not only did we shut down the membership site, but we also stopped the other programs in order to focus on building a community around the challenge program. We decided to create a new sales page with all the content that had been created for the membership site over 13 months, and as a standalone product, now offer it for sale at $297. We gave members 1.5 months notice and made everything from the membership site downloadable. We also gave them the option to pay $97 to retain access to the content for a whole year, which would cover the cost of administration fees to leave the content online for the year. After January 15th, the Facebook group will be closed and archived as well. It’s important to note that we have already replaced the revenue from the membership site with a Facebook ads agency we’ve started, as well as revenue generated from the 5-Figure Challenge program. My challenge for you this year is to focus on just one or two projects like we have, and see what happens. It could be a total game changer for your business and life!